One of the strengths of this deck is its versatility. While in aggro matchups you'll want to dig hard for Doomsayer, Explosive Sheep and Reno in order to thwart early aggression, you're better off going for early tempo against combo by keeping Mechwarper and Galvanizer. Control is a pretty good matchup, so you can keep whatever you like. 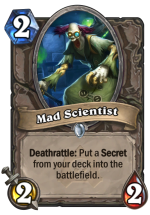 Mad Scientist is an important hold in every situation because you have a limited window to get Ice Block out of your deck before it becomes a liability to your tutoring effects like Raven and Archivist. This deck doesn't have much in the way of AoE, so Kazakus is actually quite a nice insurance policy if you can afford to keep him. This, ladies and gentlemen, is my magnum opus. When Boomsday was announced, I immediately knew that I would be dedicated to just a single cause for the rest of my hearthstone days. Make V-07-TR-0N viable. 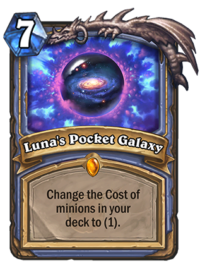 With the new magnetizable bodies, an OTK condition was more realistic than ever before – and Luna’s Pocket Galaxy sealed the deal. In the following sections, I’ll try to break down both the deck’s philosophy and strategy. 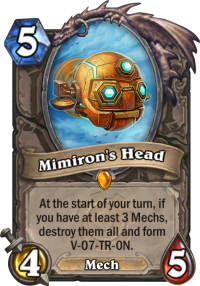 In the past, the main mechanism for summoning V-07-TR-0N has been combining Mimiron’s Head with two copies of Target Dummy before casting a completed Time Warp . Given that the Dummies are useless by themselves, the only real option is to hold them in your hand throughout the match until you’re prepared for the combo. This produces the same situation as most other combo decks, where you’re forced to rely excessively on reactive delay tactics rather than proactive defense given that your hand is often too clumsy to maintain tempo. But what if your whole deck was composed of viable combo pieces? Then you no longer have to hold onto anything in the early game! This is where Luna’s Pocket Galaxy comes into play. 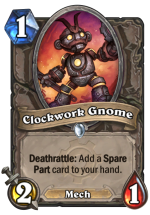 By reducing all of the minions in your deck to 1 (assuming that they are primarily mechs), you suddenly have a plethora of potential combos. 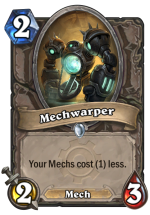 If the Galaxy hits Mimiron’s Head, then any other two mechs will do – but you can also meet the condition by either reducing a Mechwarper or Galvanizer (In either case, the mana sum looks like (1) + (4) + (0) + 5). 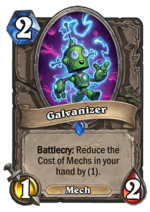 If Galvanizer isn’t reduced, all you need to do is hit two other mechs with it. Even if somehow all of these options fall through (which is very rare in my experience due to Grand Archivist and Raven Familiar ), remember that at any point where you end up with two mechs left alive on the board, you’re good to go. This situation is all the more feasible thanks to another new all-star card: Stargazer Luna. Not only does this card help you dig for your combo, but it simultaneously fills your entire board with things to distract your opponent! Between her and Aluneth, there really isn’t any need for more slots devoted to card-draw – allowing you to avoid another typical limitation of combo decks. In most cases you will only need one of your three magnetic minions for a full OTK, so you can feel free to use them as tempo plays in the early game knowing that you’ll undoubtedly have drawn the others by the time you’re ready to dance. You can always hold onto all three if you think the opponent is going to have a lot of armor or taunts. They can also serve as combo pieces by playing them to the right instead. Versatility! Now, for the quest. What activators are we looking at? 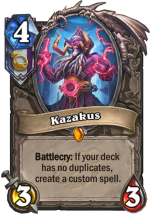 Well obviously we have Kazakus as a highlander deck, but more conveniently we get to take advantage of the good ol’ spare-part generators. The mech synergy they have is a great bonus! While we’re at it, let’s discuss the power of each part in the deck. Time Rewinder is without a doubt the most powerful one to snag, as it lets you double-dip on your Kazakus, Reno, Giggling Inventor, or pull back your Luna to save her for another round of digging. While chain-drawing with Luna, you can also use it to recall Doomsayer at the end of the turn or to bounce a cheap minion back to the right-most position of your hand and prevent an Aluneth or Mimiron’s Head topdeck from stopping your cycle-party dead in its tracks. One last niche trick is that you can rewind V-07-TR-0N and re-attack with him for an additional 16 damage since he has charge. Good for desperate situations where you have 9 mana left over but no more magnetics to spend it on. Finicky Cloakfield is another one to hold onto, as you can combo it with Doomsayer for a very likely board clear, hide your Snowchugging Missile Launcher, or again simply protect Luna for a turn. Reversing Switch is great for buffing up V-07-TR-0N’s base attack from 4 to 8 (effectively 16 damage to 32 damage) if you can manage to complete the quest without using it. Might want to hold onto it if you think the opponent is the type to tank up, or if you feel forced to use your magnetizes early. It can also allow you to destroy your own Doomsayer while chaining Luna. Emergency Coolant is a wonderful free delay tactic, and Rusty Horn is nice because it never hurts to have more taunts when trying to drag out the game. Armor Plating and Whirling Blades are pretty filler – but with a deck that draws so heavily, junk like this is great for getting the quest done while still being able to dump your hand every turn. 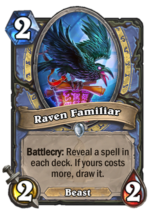 Cabalist's Tome is there just to make sure you don’t have to draw your whole deck to finish the quest, and gives the Archivist and Raven something to do if you’ve already drawn Pocket Galaxy. 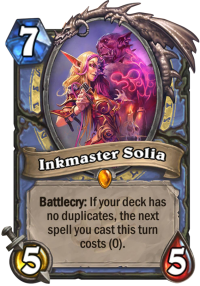 Inkmaster Solia is the card that has surprised me the most. I mean sure, she’s great for reducing the tempo loss typically associated with Pocket Galaxy or Cabalist’s Tome – but if you draw her after playing Galaxy, it gets even better. You can actually cheat out a 10-mana Kazakus Potion for just 1 mana! 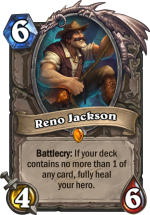 This allows you to combine a full board clear with Reno on the same turn – an absolutely insane tempo swing when you’re behind. 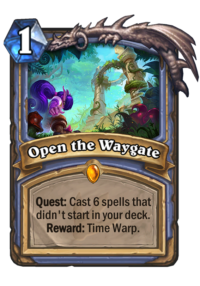 She can also serve as yet another way to pull off the combo (if none of the key cards were hit) by reducing Time Warp’s cost to 1. Even if all she does is cheat out a clumsy pull from Tome like Glacial Mysteries or Pyroblast, she’s worth it. I didn’t think she’d be that great when I first included her, but now I wouldn’t dream of leaving her out. Magnetizing Missile Launcher to Snowchugger can be absolutely hilarious, and you may want to hold onto one or the other in games against minion heavy, low spell decks like Paladin or Hunter. This silly little gimmick has single-handedly won me a few games when the opponent couldn’t get rid of it. 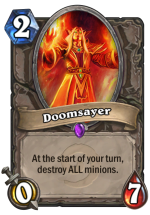 Using Time-Warp + Doomsayer is another possible out that can turn a hopeless situation into a win if your opponent over-commits. 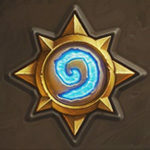 One of the big drawbacks of Reno Mage has always been its lack of a definitive win condition. Relying on a value fatigue strategy is becoming less and less viable as other decks include their own form of inevitability. Most big finishers often rely on duplicates, but there’s no such problem here! This does sacrifice a lot of the good control options though, such as Flamestrike, Blizzard, Meteor, and Polymorph. This deck tries to compensate by instead being proactive – more like a mech deck that heavily relies on trading to keep the board under control instead of going for face damage. I personally feel like it’s worth leaving out these spells in order to maximize the chance of an early Galaxy pull, but feel free to try putting in a Blizzard and Flamestrike, as they do at least synergize with Archivist. There are a lot of flexible spots in this list that could easily be replaced with experimental alternatives. Most notably Spider Tank, Arcane Nullifier X-21, Piloted Shredder, Giggling Inventor, and Rusty Recycler. None of these are core by any means, I’ve simply found them to be the most convenient options that ensure a deck full of mech targets for Galaxy. I still don’t know if I’m sold on Ice Block yet, given that it can prevent an early Galaxy pull via Raven or Archivist. This is the reason for the inclusion of Mad Scientist, but that’s another useful slot being taken up. One thing I’m sure would be an improvement is an inclusion of a Voodoo Doll, and I’d recommend experimenting to find where it feels best to substitute it in. Book of Specters: Tempting given the high density of minions, but It has discarded Galaxy, Tome, and Ice Block when I needed them far too often for me to justify the extra cycle. Doesn’t play well with Raven, either. Archmage Antonidas: On paper this sounds amazing, right? Eats spare-parts like candy, gives you more spells to complete the quest, and serves as an alternative win condition if he gets reduced by Galaxy or hidden by a Cloaking Field. In my experience, though, he ends up being way too clunky – as his fireballs are hard to get rid of if you already have Aluneth equipped, and he’s not really playable until turn 8 at the earliest if you get him before Galaxy. You have to ask yourself if the extra win condition is worth potentially sacrificing your early game. Feel free to try him out, though. Foe Reaper 4000: This card is absolutely amazing when combined Zilliax (if either is hit by Galaxy). It’s basically a second Reno + triple removal that leaves a scary minion on the board. Feels great to pull off, but unfortunately I don’t think the deck can afford another 8-drop in your early hand against aggressive decks. Medivh, the Guardian or Blingtron 3000: I used to run one of these as a means of removing Aluneth to slow things down and avoid fatigue damage, but I’ve come to the conclusion that it’s better to just save Aluneth for once you’ve either played Galaxy, Tome, or fully emptied your hand – and simply commit to the OTK. You don’t have to play Aluneth if you draw Luna, so really you can think of it as an emergency measure. But either way, holding another card in your hand just for safety is simply too slow. Skaterbot: A pretty neat way to turn one of your minions into removal. 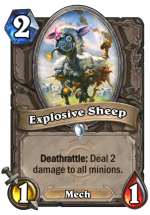 Also good with Foe Reaper and Explosive Sheep. Not bad, but I think there’s just better options that don’t depend on support from other cards. Flame Leviathan: I really wish this card was good. I mean, the effect itself is great in this deck since you don’t have a lot of removal, and it has saved me far more often than it has hurt me – but getting a 7 mana 7/7 in your opening hand is the real bummer. Not worth it (unsurprisingly). Antique Healbot: The extra healing is often superfluous, and it isn’t the type of card you can just drop on curve efficiently all the time. Back to the junk heap. Faceless Manipulator: Now don’t be greedy. Feel free to drop any suggestions! This is definitely still a work in progress, and I never get tired of daydreaming about how to improve it. Great deck! I would love to see some gameplay of it. Sure thing – in addition to the video linked at the top of the description, I went ahead and added a few deck tracker replays from some of my latest games. Might make a more cohesive montage when I get some time. 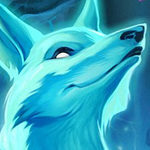 Have you thought about running Frost Lich Jaina as an alternative semi-win condition? I’ve thought about it, but I decided against it given that her high mana cost is rather disruptive to the combo gameplan – she’s a really bad topdeck from Luna that can prevent much needed cycling, and in most matchups her effect won’t really get to shine much. She might improve your odds vs. aggro though by giving you another way to sustain – if you try her out, let me know how it goes! I use her and she is great! Nice, I’ll have to give it a shot. I love this deck!!! I have tried to make a more control-oriented version of the deck, and it is amazing! Great idea! Seems like a fun deck, but I went up against three Mages in a row, and in Wild they will all usually run at least one Ice Block – which tends to kill a OTK. Add in that the third one had been holding onto a “sheepmaker” spell for just such an occasion… sigh. Still, a great concept!